“It has been a quiet week in Lake Wobegon …” So starts many a tale from Garrison Keillor, and many times I have been tempted to lift that line in prelude to a blog entry that, like a Wobegon story, gradually reveals events that are anything but quiet. Here in the desert I can feel the energy ramping up. While the polar vortex captures the attention of those in the north, we have our own sort of vortex which re-directs RV travelers to Arizona right around February every year. First it’s the annual migration to Quartzsite, where thousands of RV’ers congregate for cheap camping and flea-market shopping every winter. 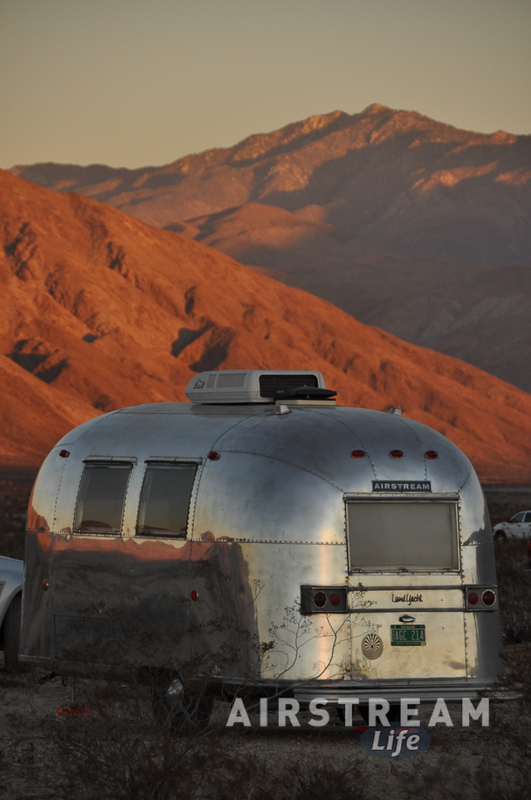 Now Alumafiesta has entered the picture in a small way, bringing our Airstream friends from all over the country to Tucson for a week or two of warm weather and camaraderie. I can tell by many signs that the Airstreams are approaching. The most obvious sign is the mail piling up in our front hallway. Several friends have asked if they can have their mail forwarded to our house, and of course we always agree because it’s the right thing to do for fellow Airstreamers. When we were full-timing we often were helped by people along the way who received mail for us, so this is a sort of “pay it forward” gesture. Looking at our hallway right now I see three boxes, two large flat envelopes, and four other large boxes that contain Alumafiesta supplies sent by Brett. My email inbox contains a bunch of tracking numbers for additional packages to arrive this week. Another sign of the impending aluminum invasion can be seen at our friend Rob’s house, not far away. He has a bit of acreage and a few hookups, and the word got out, so now he has four RVs camped by his house, one of which is waiting to attend Alumafiesta. 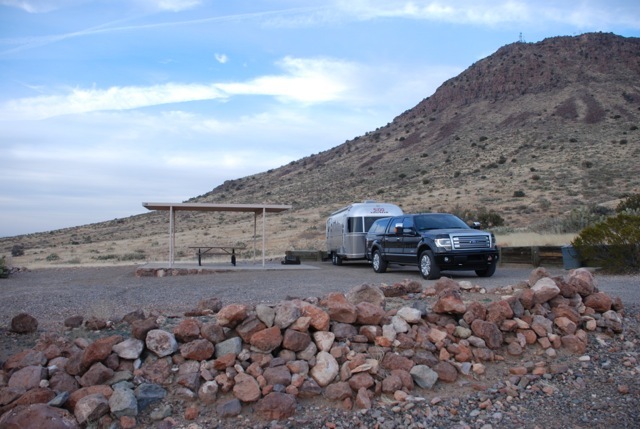 On the southwestern side of Tucson there’s a bit of BLM land that allows free camping, called Snyder Hill, and the first Airstreams have appeared there as well. 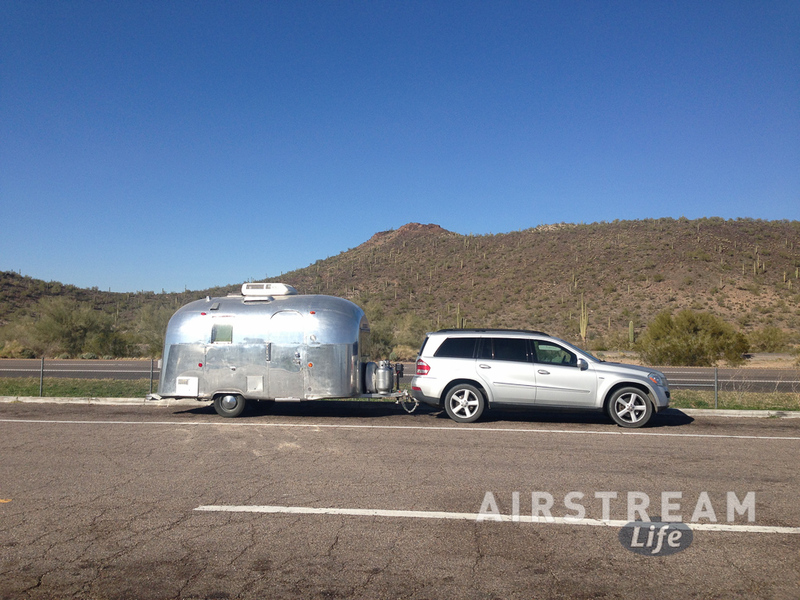 Over at the Alumafiesta campground (Tucson/Lazydays KOA), I can see a few glints of silver starting to take over. In nine days, about 110 Airstreams will be camped there. Last week I started getting emails from people who are on their way. One photo came from Rockhound State Park in Deming, NM (at left). Other emails have come from central California, Texas, Florida, and a few from frigid parts of the north country. Everyone wants to get together, of course, because Airstreamers are generally social types and we see many of our good friends only once a year or so. This year it’s a little frustrating because we are deeply engaged in getting ready for two major events (Alumafiesta and Alumaflamingo) and about six weeks of Airstream life/travel between here and Florida. Eleanor has been working on a new food demo that she’s going to do at both events, and I’ve been trying to get the Summer 2014 magazine at least 70% done by February 1. Plus, Emma has been working toward a higher rank karate belt and so we’ve been taking her to practice five nights a week. It’s really a drag when work and school get in the way of having a good time. A few days ago I pulled out the “Safari Departure List” that I maintain for pre-trip preparation. This list has checkboxes for about eighty things that we need to do before we head out on a multi-week trip. It covers everything: what to pack, taking care of the house and utilities, prepping the Airstream and car, and various notifications we need to make. Completing this list takes about two weeks if I don’t rush, so every day I’m trying to check off at least five or six items. Lots of them are easy, like filling the car with fuel and updating our mail forwarding order, so it’s not terribly hard, and having the checklist means I don’t have to try to remember what’s next—which is good, because with everything going here I can barely remember what comes after I put toothpaste on the brush. With all the activity comes a certain amount of excitement. Great things are about to happen. We’ll see lots of Airstream friends, travel cross country, present talks and demonstrations, tour Tucson and Sarasota, lead a ukulele band (at Alumaflamingo in Florida), and then hit the beach on our way home for a bit of vacation. 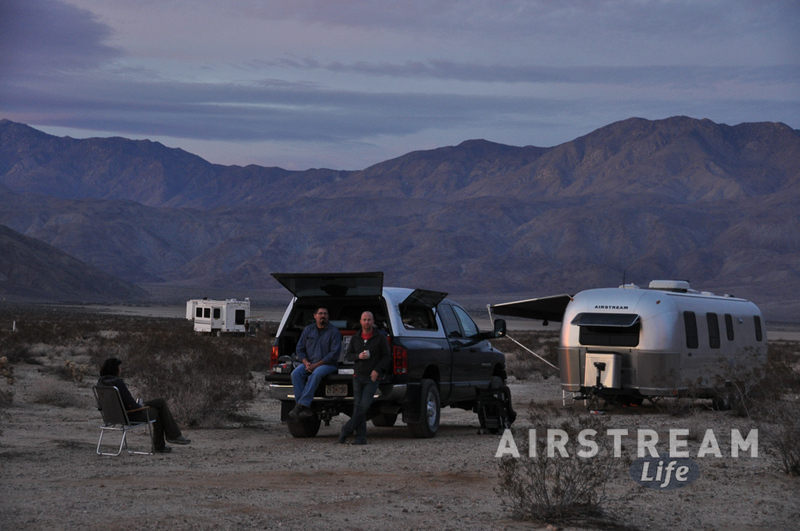 It’s hard to complain; Airstreaming is fun. The anticipation keeps us energized. Some would say “stressed” but I prefer to think of it as all positive energy. A hundred+ Airstreams parked together will raise the temperature of Tucson and make everyone smile. All these people coming to town with great intentions, friendly faces, and interesting thoughts to share, will infuse us and give us the boost we need to get it all done. So I say, “bring on the aluminum energy!” The fun is about to begin. 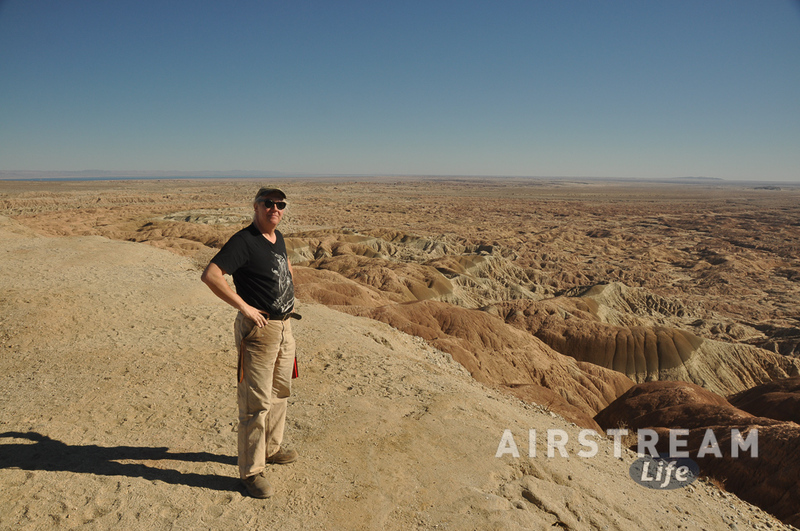 The past few days in Anza-Borrego camping without my family has been an enlightening experience in some ways. I have realized that when I am camping solo, I prefer to be away from campgrounds. Campgrounds are filled with other people and their families and I find them strangely distracting. It’s the “alone in a crowd” feeling. I don’t usually notice much about the other campers when we are traveling as a family, because we are engaged in our own lives and there’s usually something that needs to be done. But when solo, there’s a stillness about the trailer that invites contemplation (navel-gazing, I suppose). At those times, it’s great to be out in the desert with not much else around. 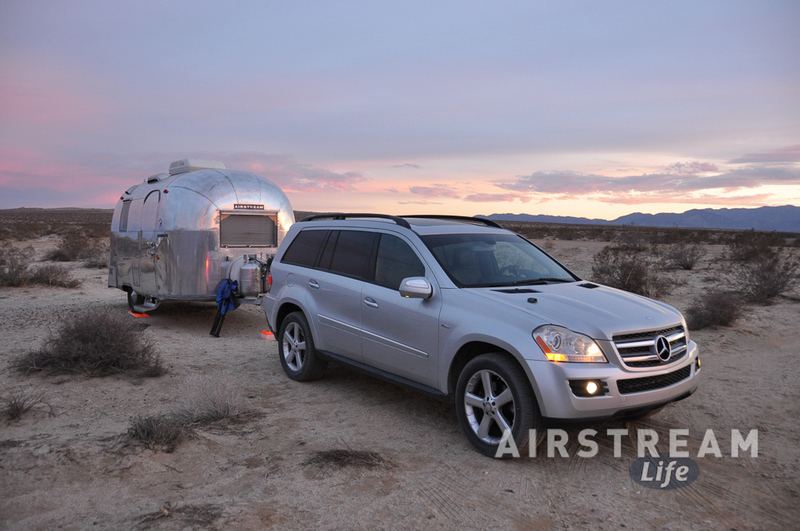 So I know that the next time I am looking for an opportunity to be alone and contemplative, taking the Airstream out for some boondocking will be just the ticket. That may not be for some time, since we have a heavy travel schedule through February and March. On this trip it was nice to see all my friends happily engaged in their lives. Brian & Leigh were busy working on their respective jobs in their “office” at the dinette. Likewise, Alex and Charon both seemed to be deep into creative projects of various types, although I did manage to break Alex away for one day of recreation. Stevyn & Troy have been exploring the world of full-time travel, and while they are still getting their footing, I can see that it probably won’t be long before they have a regular routine with their two kids as well. I took their family out for a little exploration, since they’ve never been to Anza-Borrego and had no idea of the many curiosities and phenomenae to be found. 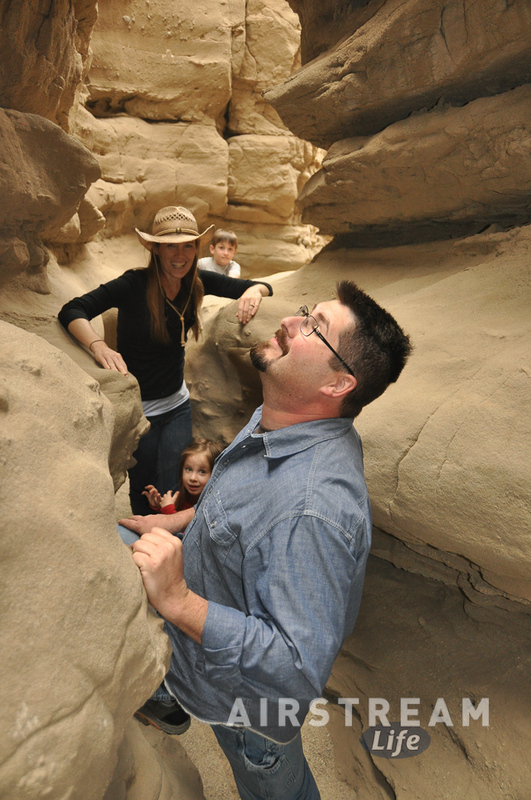 The Slot Canyon, always a favorite, was a big hit. It was as much fun for me to show it to them as it was for them to explore it. I was particularly gratified when Troy turned to me and said he was having that peculiar sensation you get when you actually see something in person that you had previously known only from photographs in National Geographic. I know that feeling—it’s one of the reasons we travel. In the evening all of our local Airstream circle gathered by the tailgate of Troy’s pickup truck, with my old gas camping lamp hissing, and we talked for a couple of hours. I had picked up an apple pie in town (nearby Julian CA is famous for those), and Leigh warmed it in the oven and split it among us. It all seems so mundane as I recount this, but at the time it was the perfect thing to do. As simple as it was, it felt like a great moment in life. That’s perhaps the best thing about this sort of camping. We have no shopping, no school, no jobs except what we bring with us, and few distractions. The nights are cold and long in the desert winter, and you’ve got to make your own entertainment. This encourages more of that introspection I was talking about, and it encourages old-fashioned socializing. Bonding together over pie and conversation is what it’s all about. I could have happily stayed out for another week, traveling through California and Arizona, but my time was up. Appointments, obligations, and demands of work were calling me back to home, so that evening I pre-packed the trailer and started thinking about the long drive back. There are very few good overnight stopping points along I-8, and I needed to get back ASAP, so in the morning the only thing to do was to hitch up and hit the road as early as possible. I’ve been coming to this park for years, partly in a park this big there’s always an opportunity to see something new—if you just make the effort to look. The rangers and volunteers who staff the visitor center, and the people you can find camping in the less-traveled areas, are a great source of tips. 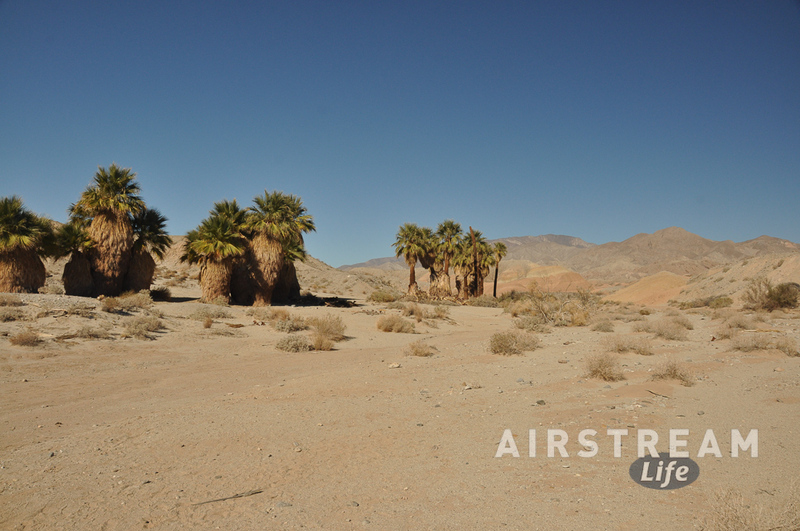 Yesterday I pulled Alex away from his computer to get out for “an adventure.” We decided to do a little off-roading near 17 Palms, a palm oasis that’s a couple of miles off S-22, starting at the primitive Arroyo Salado campsite. The roads are always sandy, potholed, and occasionally a bit “technical” requiring some driving skill to avoid getting stuck. None of the roads I’m going to talk about are passable with a 2 wheel drive vehicle, or any vehicle that doesn’t have high ground clearance. I mention this because we still remember the Tale of the Sinking Dutchman, who thought that a Subaru Outback constituted a suitable conveyance on the local trails. It has become a favorite campfire story among the 4WD owners. 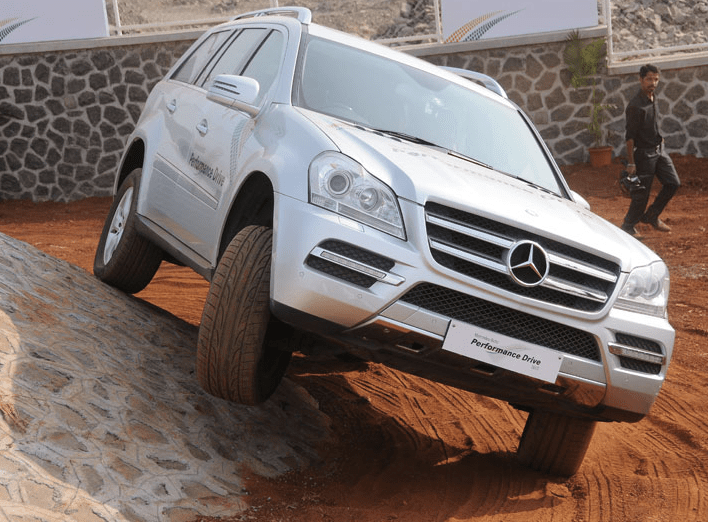 The Mercedes GL is a remarkably capable off-road vehicle. I know that probably 99.9% of owners never take them off pavement, but they should give it a try. We’ve off-roaded with ours in many places over the years, and it has always been surprisingly good it, despite its bulk and street tires. I’m selective about where we go because I don’t want to strip the paint off by rubbing a piece of sandstone, and I sure don’t want to get stuck. This is an area of “concretions”, which are basically like pearls made of natural cement. Wet sand sticks to a “seed” object like a pebble, and becomes cemented to it. 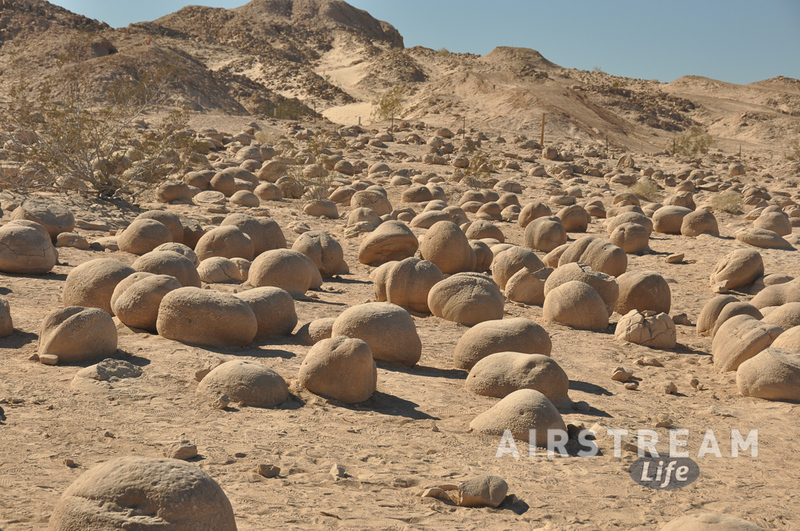 Wind erosion shapes the concretions as they gradually become exposed to the surface, hence the pumpkin shape. Pumpkin Patch is in the adjacent Ocotillo Wells Off-Highway Recreational Vehicle Area, which is a long way to say that it’s where the ATV’ers and motorcyclists are allowed to ride. We met up with a few of them and they tipped us off to a hidden spot where supposedly there were “statues” made of rock. They weren’t sure where exactly they saw it, and sent us on a wild-goose chase down the Pumpkin Patch Trail. I can now attest that this trail is passable by cars … but I wouldn’t recommend it unless you really like off-roading in tricky conditions and have the right vehicle. It’s really Jeep country. Since Alex and I were, uh, “rather concerned” by the conditions as we slowly drove through, we didn’t stop to take photos, but we probably should have. If you drove this trail in a Jeep you would not believe that we’d done it in a Mercedes GL. Of course we never found the rock statues, but by the time we escaped Pumpkin Patch Trail and settled into the relatively flat washes, we didn’t really care. It about another 90 minutes to work our way out of there and back to the pavement of S-22, plus time for a stop at another spot we’d never seen before: Vista Del Malpais. Alex called Vista Del Malpais “the best view in the park,” and I think he might be right. It’s a lot like the view from Font’s Point but even more panoramic. The Salton Sea is visible to the east, badlands spread out in front in Technicolor beauty, and mountains ringing three sides. It really can’t be fully captured in a single photo. Going to Vista Del Malpais is mandatory if you really want to appreciate it, like seeing Grand Canyon in person. After all that, it seemed like a good idea to head over to the Palms At Indian Head Hotel for a burger by the swimming pool. Just as the sun was setting behind the mountains, Alex & Charon put on a show for all the RV’ers in their encampment (about 1/4 mile from my site) and for anyone else who cared to show up. This is the same show they’ll be doing at Alumafiesta next month in Tucson, full of sword swallowing, fire breathing, and other specialties of the sideshow arts. I’ve seen it probably eight times and I still love it. From the reaction of the crowd (from age 3 to 60+) it was clear they loved it too. Today’s plan is much like yesterday’s plan: no plan. We shall see what happens. It’s another beautiful day in Borrego Springs CA (sorry to all of you trapped by the snow & cold right now), and probably it is my last day before heading homeward, so I’m going to try to make the most of it. Yesterday I relocated the Caravel out to the open desert, just beyond the boundaries of town. No more full hookup for me on this trip. The Caravel’s systems all worked beautifully while I was in the state park campground for two nights, and so the next step is to test everything in boondock mode (without hookups). Somehow I doubt I’m going to get to all of those projects, at least not until I start using this trailer on a more routine basis. The Caravel is a fun trailer for one person, but not highly practical. You can do only one thing at a time in it. You can cook, eat, sleep, shower, or work—pick any one, and put everything away before switching to the next. There just isn’t room to leave anything out. When Eleanor and spent our first night in this trailer, back in August 2003, we were traveling without Emma and found the Caravel to be delightful. It rained that first night, and I remember feeling wonderfully encompassed in the tiny aluminum shell while the rain pattered on the roof. Later when we traveled with Emma (age 3) it never seemed too small, probably because our point of comparison was a tent. Today I think I would describe it as “romantic” for two if you like cozy surroundings. (I mean “cozy” in the real estate sense: small.) The three of us no longer fit in it, at least not at the same time. The real point of a vintage trailer like this, if we’re going to be brutally honest here, is that it attracts lots of admirers because it’s just so darned cute. Everyone comes over and admires it. I give a lot of tours, so I feel obliged to try to clean it up every morning just to be ready for the possibility of someone wanting to peek inside. Being so small, it doesn’t take long to see it all, in fact you can see it all just by leaning in the front door. Being out here in the desert is much quieter than the state park campground. By unspoken agreement, the RVs parked out here are scattered very widely unless they are deliberately camping together, so my nearest neighbors are Brian & Leigh about 100 feet away. Stevyn & Troy are probably 200 feet away, and other than that I am mostly surrounded by open space and dry creosote bushes. I prefer it, these days, to a campground, even though the Caravel isn’t optimized for boondocking. It’s not bad even with only one battery, because the trailer doesn’t need much power. I converted all the lights to LED and so the only significant long-term power draws are the circuit board in the refrigerator (even on gas it will use 6-10 amp-hours per day) and the laptop. To make up for that, Brian has lent me his portable solar panel, which generates 120 watts peak, and that’s more than enough to recharge my daily needs, in about an hour. There’s no furnace in this trailer either, just a catalytic heater which uses no electricity. The past two nights have been balmy, which is pretty rare right now since the eastern half of the country is in the deep-freeze. I hadn’t even needed to turn on the heater until last night when the overnight temperature dropped to 35 degrees F. Around 5 a.m. I finally couldn’t stand it and fired up the catalytic heater, and then of course I couldn’t get back to sleep so I ended up at dawn taking pictures. That wasn’t really so bad, especially later when I found a photo in my email from my friend Charlie showing his home in Indiana covered by 10 inches of snow and temperatures dipping to -14 degrees F.
Today’s plan is to roam around the park with Alex, rather aimlessly. We plan to buy a Julian apple pie, otherwise it’s a solid plan of do-nothingness. Last night a few of us went to Font’s Point to see the badlands at sunset, when they are just stunning, and I think that set the tone for the next few days. We’re just going to take in the beauty of this place and not worry about agendas. Or anything else.